These conversation heart coasters are the perfect non chocolate Valentine's gift. 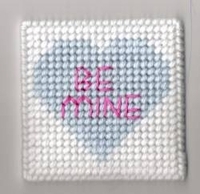 Each set of coasters has four different message hearts. "Be Mine",Love You", "Hug Me" and "Kiss Me". Coasters are approx 3 1/2" square, handmade from plastic canvas for easy cleaning. These are not only perfect for your Valentine, but also a nice gift to give to your sweetheart anytime. Hurry only one set left.